"Finnegan St. Andrews has lost everything. His perspective on the world is forever changed. Anasofiya Deschanel no longer knows who she is...or what. She longs both for what she has, and all she has left behind. Aidrik the Wise has vowed to do anything for his evigbond. As he watches her life force slowly ebb, he begins to understand the sacrifice he must make to save her. 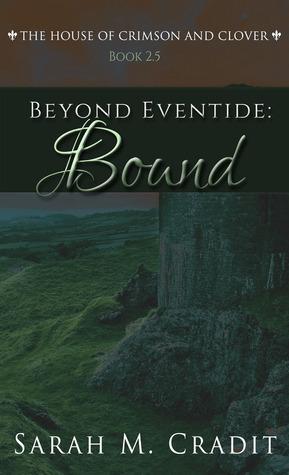 All three individuals are bound by love, promises, and the undeniable threads of fate." The Deschanels have serious issues to confront and deal with, not least finding Ana and Aidrik before any harm befalls them. Nicolas has passed on his inheritance to Ana and so to her son. But the baby must be born in wedlock. 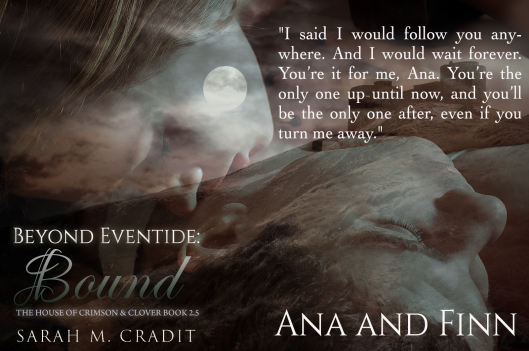 Will Finn, Anne and Tristan find Ana and Aidrik in time? 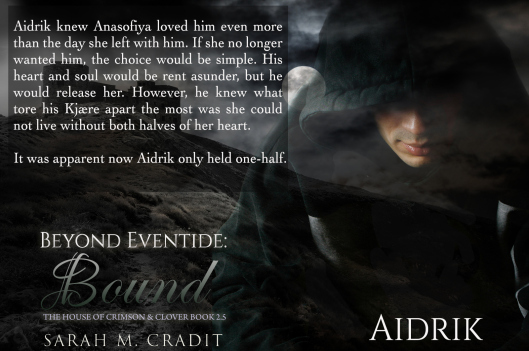 And will Finn and Aidrik come to terms with the knowledge they both love Ana and she them. The spectre of the Empyreans’ Eldre Senetat hangs over the Deschanels and their families. They know if the Senetat finds out about them their lives will be in mortal danger. I love the way this story is evolving and the direction it will take is anyone’s guess. I’m looking forward very much to finding out what happens next. There are some new characters introduced, most notably Tristan who adds to the story and matures quite quickly on this, his first mission for the family. There’s a lot of character development in Bound. Nicolas is growing up and taking his responsibilities more seriously and even if his self-confidence has suffered a blow there are still flashes of the old Nic. And Ana, in spite of everything that’s happened to her, is finally comfortable with who she is as her emotional tug of war is resolved. I love that Finn is as steadfast as ever and never wavers in his determination to reach Ana. Although some matters are cleared up this book sets up the excitement and uncertainty of what will happen with the Empyreans. 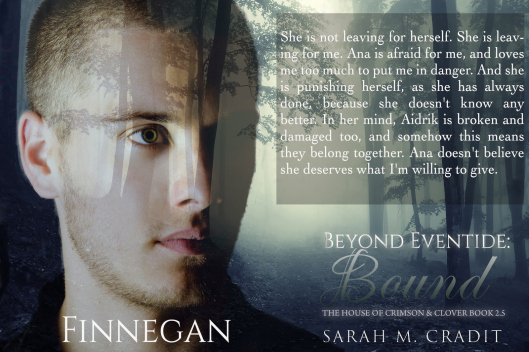 As always, Sarah Cradit’s writing is so evocative and visual and Ana and Finn’s story is quite emotional. The descriptions of Wales are so detailed, I could almost feel as though I were there, shivering in the cold. 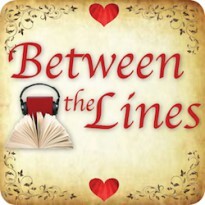 I love reading or listening and being transported by wonderful writing, right into the middle of the story.